As a PDO cheese, DODONI Feta is as authentic as you can get. Our special breeds of sheep and goats graze on biodiverse grasslands, producing the fresh milk that gives our feta its unique aroma and flavor. It’s tangy, slightly salty and sharp with a firm texture, making DODONI Feta perfect to eat by itself, as a topping for salads and recipes or as an ingredient in sandwiches, omelets, appetizers and more. DODONI Feta Cheese blocks are available in 7oz. and 14oz. containers with brine. DODONI Crumbled Feta Cheese is available in 5oz. and 16oz. tubs with a flip-top opening. DODONI Organic Feta Cheese is available in 5oz., 7oz., 14oz. and 35oz. containers with brine. DODONI Barrel Aged Feta Cheese is available in 7oz. vacuum packs, plus 5oz., 7oz. and 4.4lb. containers. 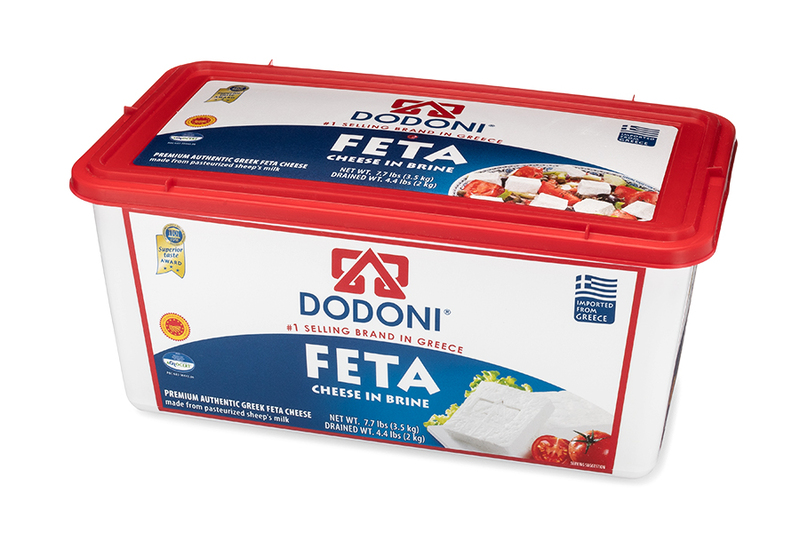 DODONI Feta Cheese Blocks are available in a 28oz. tub with brine at COSTCO. DODONI Halloumi is made on the island of Cyprus using sheep's and goat's milk. It’s firm, notably tangy and not too strong. Enjoy it sliced as a simple snack, cubed in salads or melted in or on casseroles. The ideal way to eat this unique cheese is to fry it or grill it. Grilled halloumi is great as an appetizer, paired with melon or served on salads. DODONI Halloumi is available in a 7.9oz. vacuum pack. A traditional white cheese, with a slightly spicy taste, made from pasteurized goat’s milk. Use it to liven up cream-cheese based dishes and desserts, spread across meats and vegetables or smear on toast. DODONI Goat Cheese is available in 7oz. vacuum packs and 14oz. tubs. DODONI Myzithra is a hard cheese made from sheep's and goat's milk. It’s similar to ricotta cheese, only a little drier. It is great for grating and suited for sprinkling over hot pasta. DODONI Myzithra Cheese is available in approx. 1.8 lb. size.